1. The value of each scholarship shall be RM10,000 or more by way of waiver of tuition fee. 2. All courses must be undertaken and completed in Malaysia. 3. The scholarships are for different types of courses in terms of disciplines and levels. 6. Students are allowed to apply to more than one institution but only one scholarship offer will be made. 8. Applicants may apply to participating institutions based on their forecast result. However the award of scholarship shall only be made on receipt of the detail results. a) Applicants must be Malaysian citizens. b) Applicants must possess good academic results in SPM/‘O’ Level, UEC and/or STPM/‘A’ Level examinations or equivalent. c) Applicants must qualify to gain admission to the participating institution for the relevant course. d) Applicants must be active in sports and/or co-curricular activities. e) Applicants must possess leadership qualities and be self motivated. f) Applicants must be financially deserving. g) Applicants must not already be in receipt of any scholarships, financial aid or award from other educational institutions or organizations. 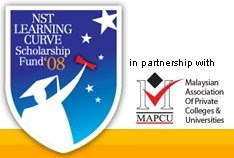 h) Applicants must abide by the terms and conditions of the NST Learning Curve Scholarship Fund. i) Applicants must abide by all other terms and conditions of the awarding institution, including any bond required. 3. Only short-listed applicants will be called for interview.